So earlier this month I was nosing through my emails and my latest email from Wowcher piqued my interest. There was an offer for a half price 5 month subscription to Birchbox… Now I’d noticed the Birchbox adverts from time to time on Facebook, but I had particularly noticed the gorgeous #BeautyJunkie decorated box this month. I had a quick google to see if I could find a Birchbox review, but there didn’t seem to be many independent reviews from the UK, so I decided to give it a go. After signing up – which was a really simple and easy process, you can select your preferences. These include your skin tone, hair colour and type, and product preferences, which you can change at any time through your account. My Birchbox arrived and I will confess to being more than a little excited. 😉 I watched quite a few unboxing vlogs on YouTube and thought I’d do mine a little differently, as I decided I’d trial the products for a week to be able to give you a decent review of the Birchbox contents. 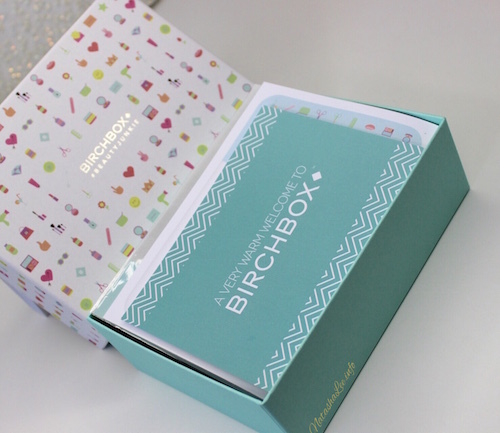 The actual box lid on the August 2015 Birchbox is stunning! 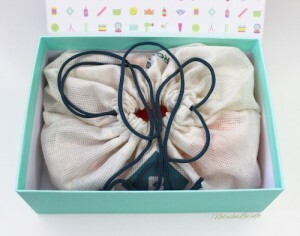 This box is definitely a keeper and is designed around the theme #BeautyJunkie. It is covered in beautiful little beauty-themed emojis and is super cute. My youngest boys James & George were desperate to get their hands on it thinking it contained some miraculous new toy! 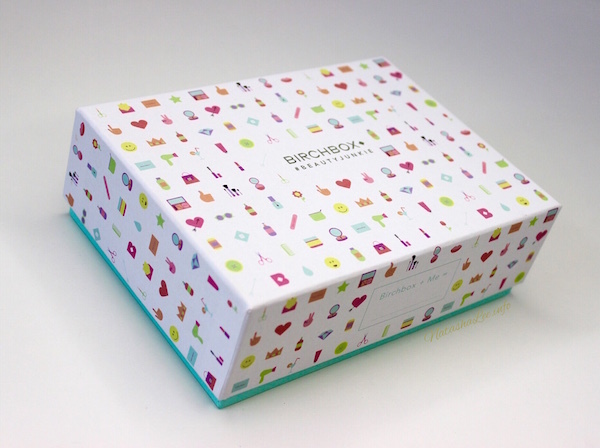 When you lift the lid you’ll find your “Welcome To Birchbox” leaflet which includes a description and directions for each of the products within your Birchbox, as well as a selection of sweet little emoji stickers that emulate the ones on the front of the Birchbox. 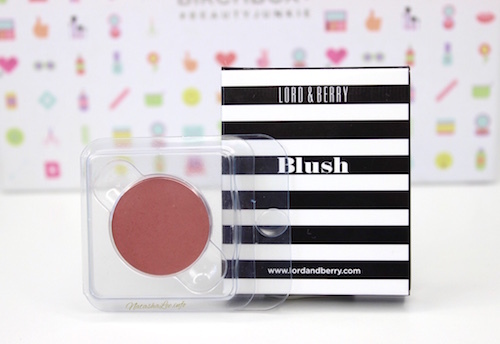 Then it’s time for the nitty-gritty………the products! Once you remove your leaflets and stickers, you find your surprise selection of products playfully nestled within a lovely little canvas drawstring bag, which would be great to keep for popping toiletries in when you are travelling or storing your nail art goodies! I was excited to see what products I had been sent and give them a trial run to see if a Birchbox subscription is worth the money. I thought I’d start with one that intrigued me most and that was a trial size Beauty Protector, protect & detangle leave in conditioner. 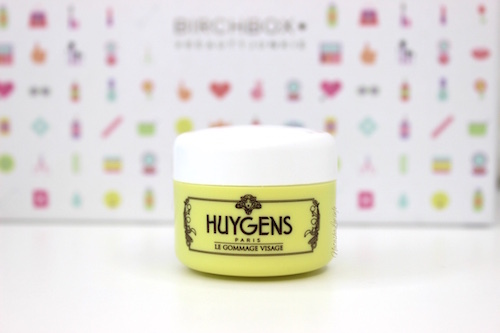 I tried to find a bit more out about this product, but it is a Birchbox exclusive and therefore only available through the Birchbox website and appears a bit of an enigma. What the Birchbox website does say about the product is that it’s a vegan, paraben and sulphate free leave-in conditioner. 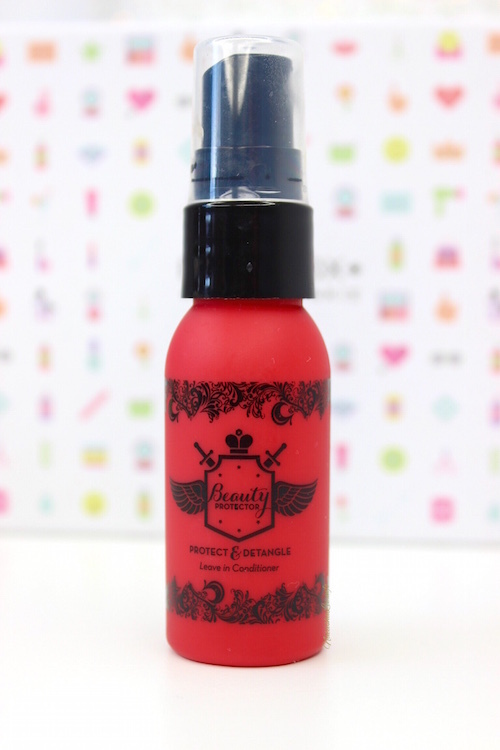 It proclaims to detangle and minimise frizz, protect your colour, add shine, protect against heat/styling, provides UV protection and is non-greasy. It professes to do the job of a number of products and I can confirm that it does! It’s absolutely amazing! After washing my hair, I applied a few pumps of the leave-in conditioner to the palm of my hand, rubbed between my hands and then ran it through my hair from scalp to tip, and then blow-dried and straightened my hair as normal. It smells absolutely divine, and applies beautifully. My hair has never been so silky as it has using this leave-in conditioner. It is worth acknowledging that when you use products regularly on your hair, it’s beneficial to use a clarifying shampoo from time to time to reduce product build up which can make hair dull and heavy. In fact, my only negative about the product is that it doesn’t spray as a fine mist like the description explains, hence me applying it to my palms instead, and the spray has a creamy deep peach colour to it, so don’t spray it near clothes, fabrics or wall coatings as it will mark. This little pot of exfoliator is an absolute gem! It smells insanely delicious, like a freshly baked lemon meringue! 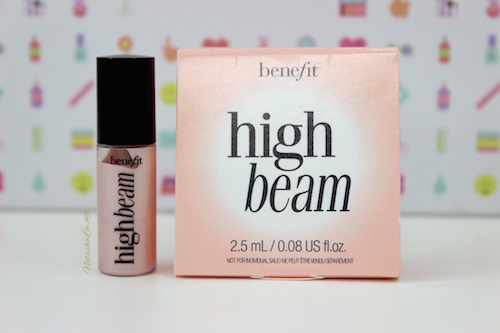 All the beauty editors in France are raving about this product and I can understand why. It has a beautiful, creamy consistency which soaks into the skin perfectly, but the exfoliating beads are gentle and effective. Whilst it is gentle enough to use every day, I’d suggest you probably only need to use it once or twice a week as it’s so effective. Whilst the pot is small, you really don’t need to use much so this is likely to last me a few months! 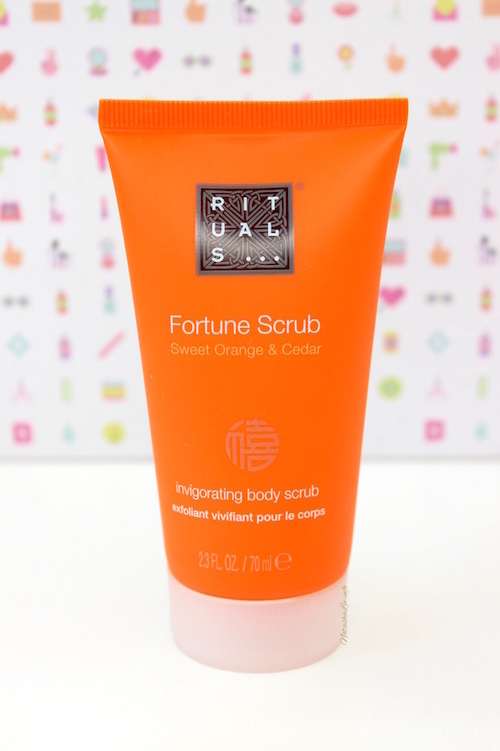 I’ve used some Rituals products in the past, but it had been a while. I have totally fallen in love with them again after using the Sweet Orange & Cedar Fortune Scrub daily. It’s heavenly! Now I am not normally a fan of citrus smelling products, so to receive 2 in my first Birchbox could have been make or break! However, it smells like the most high end spas and cascades you into a relaxing paradise just by taking off the lid! It exfoliates beautifully and lathers up into silky, tiny bubbles on your skin leaving you looking and feeling sensational! 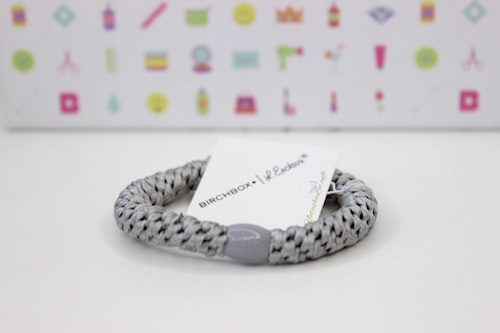 A bit of a random addition to the products in my Birchbox, was this little grey hair bobble from L Erikson! Now I don’t know if everyone gets one of these in their August 2015 #beautyjunkie Birchbox, or if I have because of my preference settings in my Birchbox account, but actually, it’s a bloody good hair bobble! I always have a hair bobble round my wrist ready to tie up my hair, and I normally buy the seamless type as they don’t catch or pull the hair as much as traditional hair ties. However they can be a bit tortuous after a full day in the salon wearing your hair in a ponytail or bun! This little beauty is actually really nice looking in the hair, and I only needed to wind it once (wrapped twice round my hair) to get a really good grip on my ponytail without pulling or snagging. 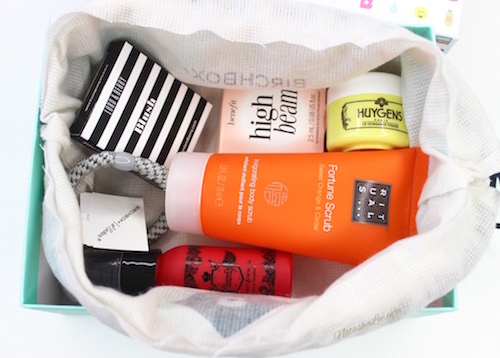 Basically, it was a random but gratefully received little edition to my August 2015 Birchbox!